First performed on the Easter Sunday of 1708 in Rome, this acclaimed oratorio details the events between - and during - Good Friday and Easter Sunday. Characters that appear in this liturgical drama are Lucifer (bass), Mary Magdalene (soprano), an Angel (soprano), St John the Evangelist (tenor), and St Mary Cleophas (alto). George Frideric Handel's 1708 oratorio is performed in the magnificent Chiesa del Gesu in Rome, Italy. Walter Attanasi conducts the Coro Aramus Orchestra di Roma e del Lazio. 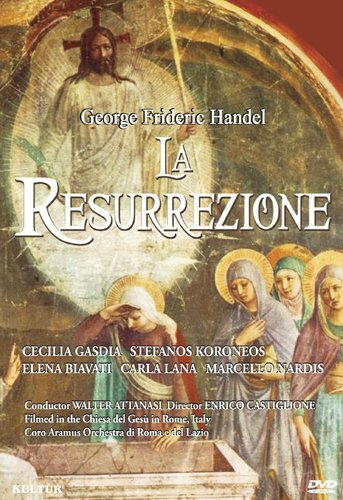 New York, NY (January 3, 2012) - Kultur is proud to announce the release of George Frideric Handel's oratorio La Resurrezione available on DVD on January 31, 2012. First performed on the Easter Sunday of 1708 in Rome, this acclaimed oratorio details the events between - and during - Good Friday and Easter Sunday. Characters that appear in this liturgical drama are Lucifer (bass), Mary Magdalene (soprano), an Angel (soprano), St John the Evangelist (tenor), and St Mary Cleophas (alto). George Frideric Handel's 1708 oratorio is performed in the magnificent Chiesa del Gesu in Rome, Italy. Walter Attanasi conducts the Coro Aramus Orchestra di Roma e del Lazio, along with soloists Cecilia Gasdia (Angel), Elena Biavati (Mary Magdalene), Carla Lana (St. Mary Cleophas), Marcello Nardis (St. John the Evangelist), and Stefanos Koroneos (Lucifer).